VY Canis Majoris is a red hypergiant and an irregular pulsating variable star located in Canis Major. The star is one of the largest known in the Milky Way, and also one of the most luminous. It is estimated to be some 3,840 light years away. Unlike many stars, which are part of a multiple star system, VY Canis Majoris is a single star without any known companions. 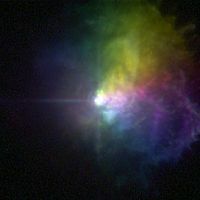 Although in absolute magnitude VY Canis Majoris is extremely bright, its average apparent magnitude is 7.9 and peaks at 6.5, rendering it invisible to the unaided eye. The first mention of the star is in the star catalog of Jérôme Lalande, on March 7, 1801, as a 7th magnitude star. During the 19th century, additional observations revealed VY Canis Majoris was a red star and that it was fading over time. It is a semiregular variable star with a period of around 2,000 days. In 1976, it was discovered that the star was located at the edge of a large molecular cloud. VY Canis Majoris itself was at the tip of the rim of the cloud and as they both share the same velocity, the star then may be associated with the cloud. Further measurements of the cloud in 2007 revealed it was prolific at creating compound molecules such as hydrogen cyanide (HCN), silicon monoxide (SiO), sodium chloride (NaCl) and phosphorus nitride (PN). The phosphorous molecules are the most interesting to astronomers, as phosphorous is relatively rare in the universe but an essential ingredient to life, as it is part of DNA and RNA, as well as ATP, an energy storing molecule. The star is classified as M3-m5e-la making it a red hypergiant. The star is estimated to be 500,000 times the luminosity of our Sun, with a surface temperature of 3,490 k. It is estimated to be some 1,800 times to 2,100 times the size of the sun in radius. More recent estimates are more conservative at 1,400 solar radii. If VY Canis Majoris was our star, it would extend to the orbit of Saturn. In fact VY Canis Majoris is so large, a beam of light would take 8 hours to circumnavigate the star. Like all hypergiants, it has a very low density and is only some 30 to 40 times the Sun’s mass. VY Canis Majoris is not without controversy. Some scientists argue that the star is not as large as thought, but instead is a red supergiant that is some 600 times the radius of the Sun’s. ↑ From definition of absolute magnitude, using apparent magnitude (ranging from +6.5 to +9.6 as the star is a variable star) and distance (3,840 ly) given here. ↑ Lada, Charles J.; Reid, Mark J. (January 1, 1978). "CO observations of a molecular cloud complex associated with the bright rim near VY Canis Majoris". The Astrophysical Journal (American Astronomical Society) 219: 95-104. This page was last modified on 9 April 2019, at 18:56.